A flavorful dip is always welcome on the party food buffet and this quick recipe is perfect to serve alongside both hot and cold appetizers. This simple dipping sauce is made with only 4 ingredients: mayonnaise, yellow and Dijon mustard, and dried dill. It is great with chicken wings, sausage balls, crab cakes, or chicken strips, as well as fresh vegetables, chips, and hard and soft pretzels. You can also use this mayo-mustard mixture as a sandwich spread; the flavor combination is ideal with turkey, chicken, and even ham, and makes a ho-hum lunch a little more exciting. In a small bowl, add the mayonnaise, mustards, and dill; mix gently until all of the ingredients are combined evenly. Feel free to swap out the yellow mustard for a grainy mustard; or, if you'd like to add a little kick, use a spicy mustard instead. You can also include a bit of horseradish and Worcestershire sauce to give this dip another layer of flavor. Although dill and mustard are a perfect match, you can use a different herb if you prefer. Tarragon is a natural choice to go along with the mayo and mustard, but parsley, chives, and even cilantro would add a nice touch. You can also toss in chopped scallions or minced garlic. If you're craving a bit of sweetness, you can squeeze in a little honey, or, if spicy is your thing, a few drops of your favorite hot sauce will do. For a creamier version of this dip, include some sour cream. To make this dip a little healthier, substitute light mayo for regular. This simple recipe can take a standard hors-d'oeuvre to the next level. Mini crab cakes are wonderful with a dollop of the sauce, and the mayo-mustard combination is the perfect counterpoint for spicy fried chicken fingers. For something a little different, try dipping the British version of pigs in a blanket, where bacon is wrapped around a cocktail sausage and baked, or serving a bowl of the dip along with shrimp cocktail or other fresh seafood. Using mayonnaise as the base for a dip is an easy and delicious way to create a creamy, tasty sauce and spread. Sweet chili mayonnaise takes advantage of the complex flavors of Thai chili sauce and Asian chili garlic sauce to make a sweet and spicy combination that is wonderful with sweet potato fries. 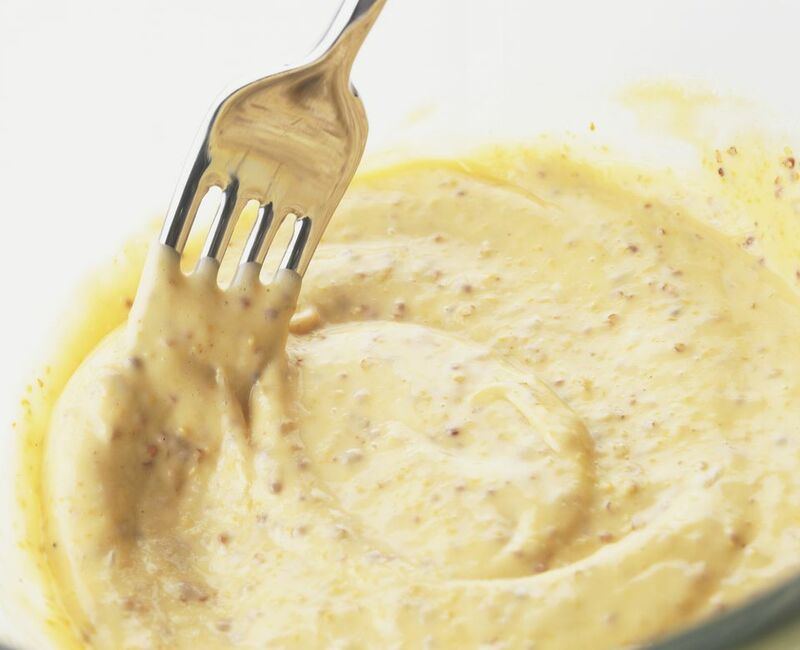 Popular in Louisiana-style cuisine, remoulade sauce brings mayo and mustard together with cornichons, capers, lemon juice, and parsley. And simple to make is a spicy chipotle mayonnaise, perfect on a sandwich of grilled chicken and avocado.